Thanksgiving is Thursday. It’s time to talk leftovers!! I know there are plenty of you out there whose favorite part of Thanksgiving are the leftovers. Personally, I am much more a fan of the feast itself, but that doesn’t mean I don’t love leftovers too! I actually make an entirely extra bird just for the sole purpose of having leftovers! Like the rest of the world, my family loves those extras, and I always find it very much appreciated if I can send some good food home with guests. Therefore, a second bird is totally needed! While we do make plenty of turkey sandwiches (another favorite way to use up extra turkey), sometimes when creating a recipe for leftovers, I’ll keep things simple and do something inspired by chicken noodle soup. Other years I like to have a little fun, and create something somewhat different. 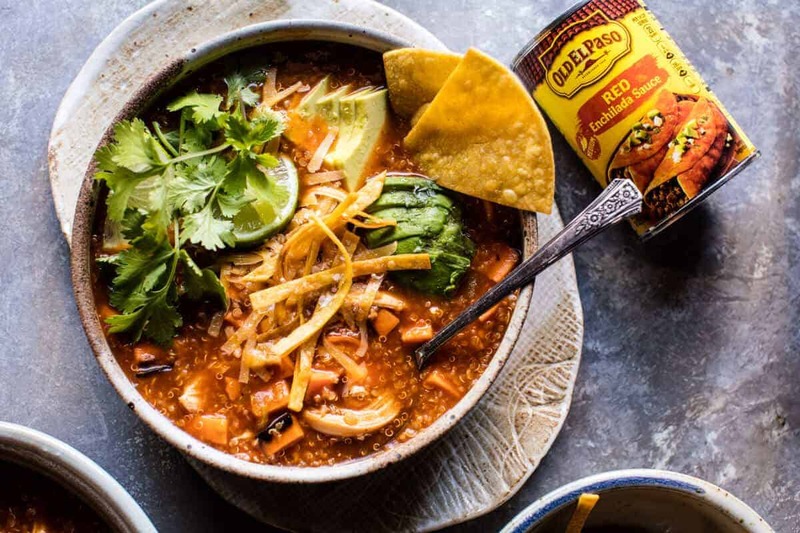 Enter this turkey enchilada quinoa soup, hearty, slightly spicy, full of healthy quinoa, studded with shredded turkey, and topped with avocado…oh, and fried tortilla chips! It is everything! 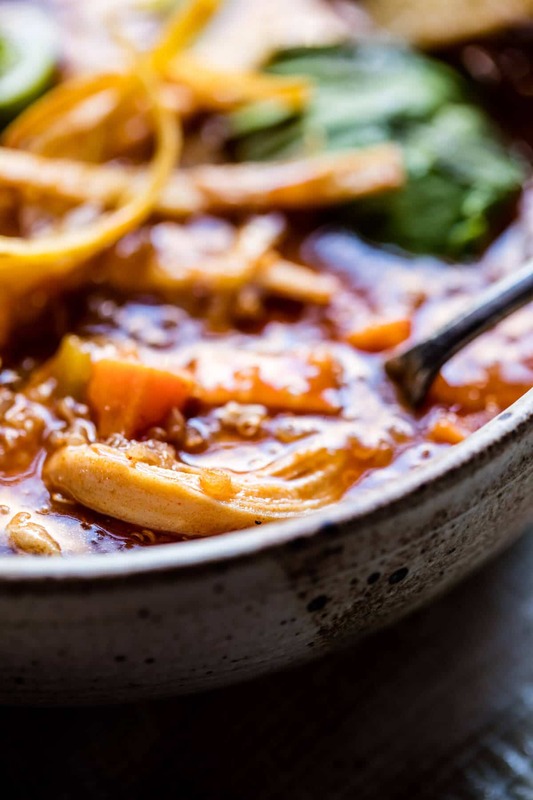 Beyond the amazing flavors, the second best part of this soup is that it comes together in NO time! 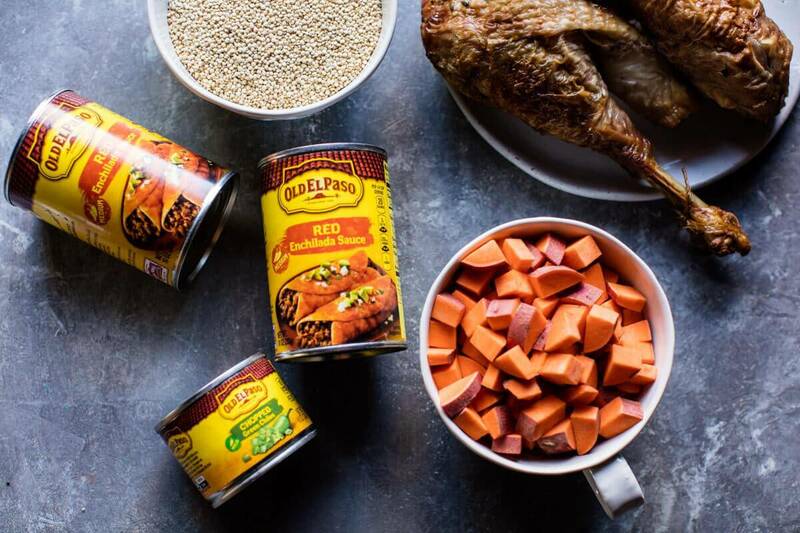 As long as you have your turkey and some Old El Paso Enchilada Sauce on hand, you’ll have the basic ingredients needed to make a delicious soup! OK well, I did add a few other ingredients, but the most important ones are the turkey and the enchilada sauce! If you don’t have any quinoa on hand, just use leftover wild rice – that would be equally delicious! 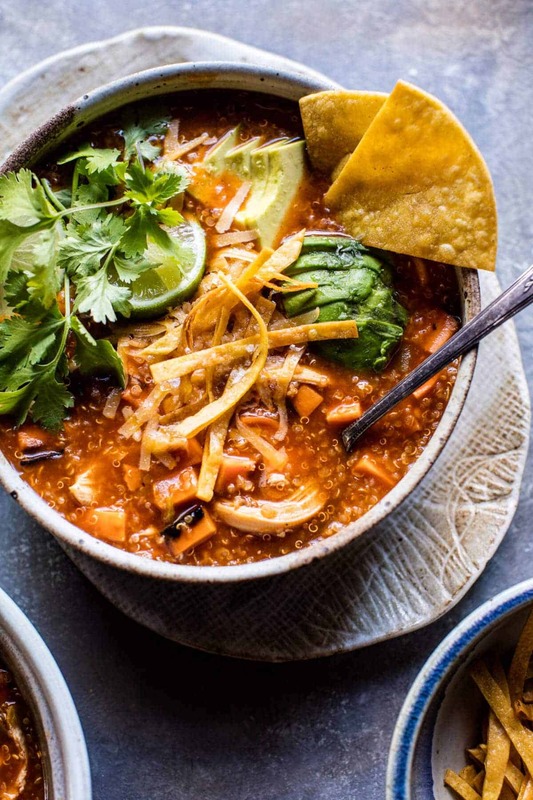 Finish the soup off with a hefty topping of cheddar cheese, avocado and tortilla chips. Then sit back and enjoy Thanksgiving leftovers in a whole new way! PS. are you guys preparing for the big feast today? I was so unprepared this year and only bought my turkey yesterday, but the planning is now in motion! How about you guys…menus set? Make sure to leave a space for an easy appetizer and roll, because that’s what’s coming up this week. YESS! Heat the oil in a large stockpot over medium-high heat. When the oil shimmers, add the onion and sweet potatoes. Season with salt and pepper and cook for 5-8 minutes or until softened and the onion fragrant. Slowly pour in the chicken broth, enchilada sauce, green chiles, and 1 cup water. Bring the mix to a boil over high heat. Add the quinoa, cover and reduce the heat to low. Cook for 15 minutes or until the quinoa is soft. Stir in the turkey, black beans, and 1 cup cheddar cheese. Cook until the cheese is melted and the turkey warm, about 5 minutes. Remove from the heat. 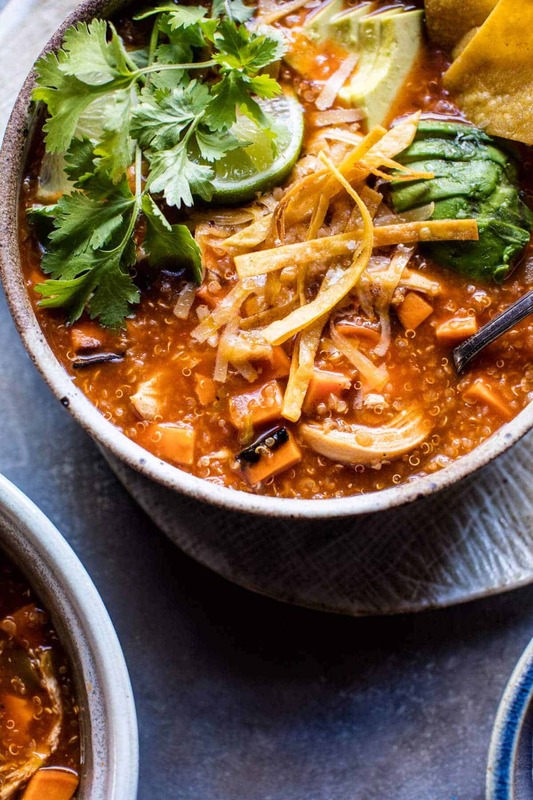 Ladle the soup into bowls, garnish with avocado, cheddar cheese, cilantro and chips. Eat! This can also be made with an equal amount of shredded chicken. If you have leftover veggies, add them in with turkey or use in place of the sweet potato. Leftovers…BRING EM ON, I am ready. 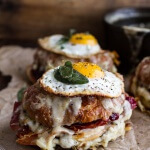 The Thanksgiving Leftovers Croque Madame. 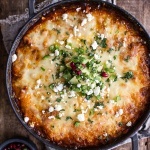 One-Pot Cheesy Turkey Tamale Pie. The soup looks so good! I love the idea of Quinoa in a soup and with my favorite ingredient Avocado. Have a wonderful week! I am really glad this soup looks great for you! Thank you Carlos! Hi Tieghan! 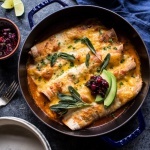 I make something similar to this with chicken, but love the enchilada sauce idea too. I will change it up next time and try this recipe. It looks great! I hope you love this recipe, Jena! Thank you! I have all the ingredients (using chicken and rice) to make this–yay! Perfect! I hope you love this Nancy! Thank you!! Simple yet delicious! I’ll do that with some leftover chicken soon. Awesome! I hope you love it! Thanks Maëva!! Okay, loving everything about this. 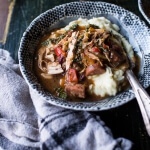 PERFECT for cold winter nights, and even more perfect for using up that leftover turkey! Totally putting this one at the top of my to-do list! That sounds totally awesome! Thanks so much Karly, I hope you enjoy this one!! This is delicious! I made it using a rotisserie chicken to have an easy meal for this week while I prep for Thanksgiving and my husband and I are both loving it. Thanks Tieghan! Awh so fun!! Thanks so much Lisa!! I love Thanksgiving leftovers, and I love soup (what’s not to love??). I never thought to add quinoa to a soup, but I’m thinking it’s a good time to try. Thanks for the new idea and Happy Thanksgiving! Ah awesome!! Thanks for making!! Loved this recipe! I doubled the quinoa to make it a bit more like a stew. I think next time I make it I’ll add a can of diced tomatoes. Yum! I’m eating with my eyes, you’re an artist. Thank you so much Rodrigo! Thanksgiving for me ended up being Indian food! Don’t mind that at all, plus we still had leftovers! I’ve been looking for healthy recipes to make for my daughter who was recently diagnosed with Type 1 diabetes. 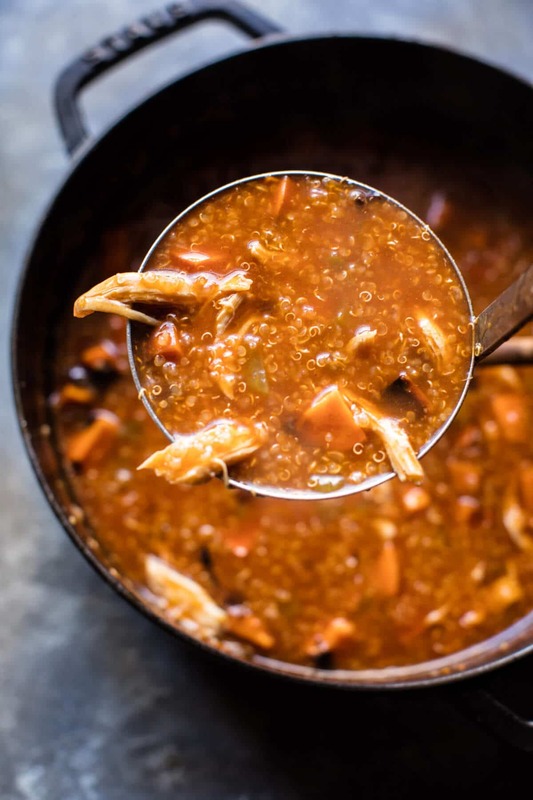 This soup is full of super foods and low in carbs and we both loved the taste. However, I missed the nutritional information that often comes with online recipes. I will try to figure it out but I would recommend that this information be added. 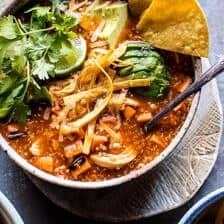 Sempre procuro receitas com quinoa, e esta sopa está realmente além do que esperava encontrar. Muito Obrigado! So so happy you finally got to try it Sarah! Yes, the sweet potato seems weird but is delicious. Everything you did sounds delicious! Your too nice (: thank you so much! Suas receitas são maravilhosas. Muito Obrigado por compartilhar. I’m no longer sure the ploace you are getting your info, however good topic. I needs to spend some time finding ouut much more or figuring out more. Thank youu for great info I usdd to be on the lookout for this information for my mission. I’ve made this something like 10 times now and it’s so delicious! I slow cook a couple of chicken thighs or chicken breasts for the shredded chicken and it’s delicious. Sounds like an amazing way to make the chicken!! Thank you! Fantastic post.Ne’er knew this, appreciate itt for letting me know. I made this for a group of people using a rotisserie chicken, and everyone gave me positive reviews! That is so amazing! Thank you! Great pole, are you congratulations? Awh that is amazing to hear! Thank you Leslie! This soup is delicious!!! Thank you for the recipe! I visit this blog once or twice a week to take some reciep. Thank you Jessica! I am so happy to hear that! It’s cheap, healthy and delicious. How to not love it? Ver este site me da cada vez mais fome, é muita coisa gostosa. Loved the Doritos in the soup!!! Perfect the recipe. The photos are great, great quality, mouth watering to see this dish. Congratulations on sharing this wonder. Thank you so much Giselle! I am so glad you loved this recipe! This is so yummy! I’m about to make it for the 4th time. I’ve been using half chicken breast and half chicken thighs. Thanks!!! Wow that is so amazing! I am so glad you loved this Joanna! Thank you so much!